Over 25 years bridal hair styling experience. More than 100 bridal hairstyles and over 2000 minutes video footage. 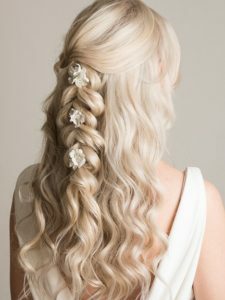 how to put hair up, to how to run a bridal hairstyling business. Monthly Payment $9.99 BUY NOW! Subscribe today & learn 100+ hairstyles. Learn how to create hair up and bridal hairstyles. 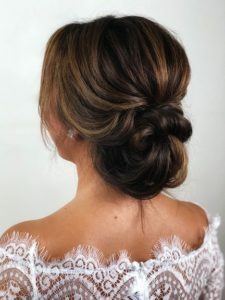 100’s of hairstyling tutorials including: hair prep, blow drying, working with different hair types, textures and lengths. 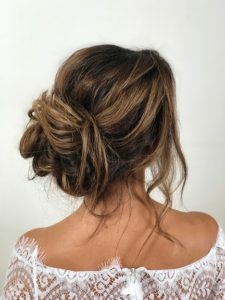 Find out how to create the latest hair up and bridal hairstyles, what products to use, how to work with padding and hair extensions. 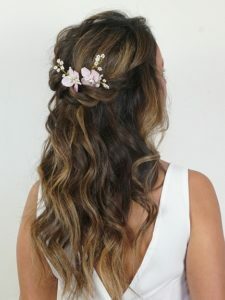 Online Bridal Hair Course $495 BUY NOW! 12 months access, 2000+ minutes teaching material, 1-2-1 advice. 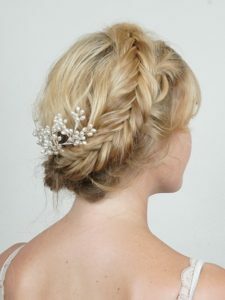 Complete the in-depth online bridal hair course work, sit your exams and get your certificate. 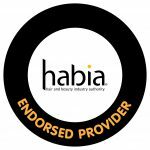 100+ tutorials, live bridal hair style tutorials, in-depth coursework and Habia certification. commented that they thought I had previously been a professional hairdresser! Join Pam in her online classroom as she creates fabulous wedding hair styles LIVE, online with our regular hair-up webinars, streamed live to your front room. Students can send photos of hairstyles they’d like to learn, ask questions and get answers there and then. Don’t worry if you miss any live bridal hair lessons – they’re all available on catch-up, any time. Available to all bridal hair online students. Over 2000 minutes of teaching material. Over 300 video tips with answers to 100’s of hair styling dilemmas. Wide selection hair styles for brides, MOB, bridesmaids & prom. 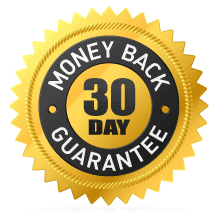 If you are not 100% satisfied with our online course, we’ll give you a 100% refund within 14 days of your order. I completed the Online Bridal Hair Course & loved it. I was practising some aspects of the course every day! I learnt so much on this course! You can watch the videos again and again, which you can’t do when you are at college. If you want to specialise in hair put ups, this is the course for you. i’m from Chile and my native language is spanish, but i understanded everything. Pam is very patience and explain everything so generous . . .
the videos are very good to refresh everything you learn, a big big experience. Pam is on hand if you have any individual questions. She is a great teacher with a wealth of knowledge on the Bridal hair world. SO many easy to follow videos for a wide range of styles and techniques. . I used to watch YouTube & hope for the best. I’ve been hairdressing for 6 years but I’ve never been shown how to do bridal properly. I bought this course on Friday – I had a wedding party on Saturday – I felt so confident. The progress I made from the beginning until now is huge. I work full time so I can work at the pace I felt was best. However, I loved it so much that I wanted to practice, practice & practice!